The holidays are done and dusted, and because the decorations are all packed your bare mantel looks pretty sad. What to do? Create a winter display. Whatever your style, the following ideas share how to cheer up a blah mantel using colors, textures, and natural elements that beautifully reflect the season. Creating a winter mantel like this one by Kim at Sand and Sisal is a cinch if you stick to wintry colors and seasonal textures. The blogger held to a palette of creamy whites, icy blues, and warm, woodsy tones. Natural elements including fuzzy cotton stems and scraggy pine cones infuse visual interest. Another good to know, every mantel needs a large item that anchors the display. Here, a mirror placed in the middle balances the arrangement. Sometimes the simplest ideas are also the best. This wood bead garland project by Michael at Inspired by Charm is an easy way to dress up a winter mantel with splashes of colors. You can buy oversized wood beads at most craft stores. Before stringing, just paint some of the baubles any shade you please using chalk or mineral paint (both types are fume free). Spring doesn't have to feel like a distant memory this winter with these fresh decorating ideas from Jennifer at Town and Country Living. A deep, blue candle holder (shown on the right) was the inspiration behind her styled mantel. The blogger says its color reminds her of the winter sky. Next, she hung a retro bird chart to anchor the arrangement. A couple of grapevine wreaths offset the ceilings tins behind the poster. The finishing embellishments include decorative glass vials, springlike greenery, and a birch bark planter with faux flowers. We mentioned earlier that a large decorative object anchors a mantel scape. The pillar for this winter display by Sue at A Purdy Little House is a DIY wreath. The blogger made it using craft supplies she had laying around. Birch branches, pine cones, and faux evergreens are additional elements that pour on the seasonal charm. Notice the books? Their spines were turned inward to create a more uniform look. Don't let the winter blues take over your living room. A mood lifting mantel like this one by Lauren at Blesser House will help you shake off that seasonal funk. The blogger says there's a fine line between both Christmas and winter décor, so it's OK if your seasonal display borrows stuff from your holiday storage bins. Here, she uses yuletide pieces including garland and decorative trees to spruce up her mantel. To keep the arrangement from feeling Christmassy, she didn't add red décor. Create a hygge inspired winter mantel like this one by Kelly at The Lily Pad Cottage. A sign featuring a lovely quote by Laura Ingalls Wilder is a homey accent. The white candles establish a cozy vibe. Every good idea starts with a little inspiration. A red encyclopedia set discarded by a neighbor kicked off this winter mantel by Kelly Elko. For whimsy, she added her favorite decorative creatures including a squirrel nutcracker. The faux succulents peeking out from the pages came next. A vintage chalkboard nicely frames the entire display. If your decorating style can be summed up as "less is more," behold this winter mantel by Jane and Sonja at Sustain my Craft Habit. The display features a few simple DIY pieces. Our favorite is the driftwood garland dipped in copper paint. Branches cut from a balsam fir shrub add some natural greenery. So that you know, the needles on this particular evergreen will stay put on cut branches for months without water. You don't need a built-in mantel to create a vintage-inspired vignette as shown by Liz Marie. The one in her home is an antique propped up against the wall. The two old trunks came next. Then she placed an Underwood typewriter, and several more vintage finds on top. The wintry touches held over from Christmas include a wreath and garland. A cabin-inspired winter mantel like this one spotted on Lily and Val will get you through the entire season including the holidays. The trick is sticking to seasonal items that don't scream Christmas. First off, a collection of papier-mâché taxidermy establishes the whimsical theme for the display. Instead of using string lights for mood lighting there's an Edison bulb on a dimmer. A pair of snowshoes, layered banners, and a little moose figure all add to the arrangement's wintry vibe. Dress up your bare mantel, with faux greenery and pom-pom garland. This decorating DIY by Jenny at Paint Yourself a Smile uses faux lamb's ear (the latter is a plant with suede-like leaves), multihued pine cones, and chunky white yarn. To make your dazzling display even more glamorous, the blogger suggests adding battery operated string lights. Adorn your mantel with a seasonal statement. This DIY sign by Doreen at Hymns and Verses beautiful sums up the time of year directly after the holidays. Her display also features two tin lanterns and a painted wood tray loaded with frosted pine cones. Decorating around a TV can be tricky. Luckily this winter mantel by Krista at The Happy Housie features a few tips that make it a snap. Instead of hiding her flat screen she decorated around it. In between the two faux evergreens is a collection of small bottle brush trees. Afterward, the blogger sprinkled on some modern farmhouse style using faux, white antlers, pine cone garland, and a bundle of birch logs. Celebrate the new year with a cheerful winter mantel like this one by Jo-Anna at A Pretty Life in the Suburbs. The blogger says she shopped around her home for all the décor. Two vintage window frames anchor the display. The faux trees and snowflake accent were held over from Christmas. The glass candle holders and pine cone garland both inject contrasting colors and textures. Here's an idea by Courtney at French Country Cottage that upcycles leftover Christmas garland. The decoration made of fresh cut greenery dried out nicely over the holidays, so she used it to spruce up her winter mantel. For extra color and texture, the blogger layered on dried peonies and evergreen branches. To complete her display's French country look, she added several LED candles. Are you recovering from a case of Christmas decoration overload? Than a serene mantel like this display by Suzy at Worthing Court Blog might be the cure. The woods around her home inspired her winter arrangement that features bare branches, natural greenery, and large pine cones. Don't have a fireplace? All you need is a mantel shelf to create a vintage-inspired vignette as shown by Stephanie at The Cozy Old Farmhouse. Besides the natural greenery, most of the pieces including the folding yardstick are found treasures picked up for cheap at local yard sales. When decorating a dark mantel, it's important to incorporate items that will pop. For instance, this winter scape by Taryn Whiteaker features decorative pieces in soft contrasting colors. FYI, the garland is a cute accent anyone can make using cotton balls and embroidery floss. If you're feeling a little antsy for spring, refresh your mantel with beautiful blooms. This late winter mantelshelf by Amanda at Love and Renovations got a room-brightening lift from grocery store flowers. To make her floral arrangement appear more expensive, the blogger combined buds and sprigs from different bouquets. This wintry mantel by Elizabeth and Company Vintage celebrates the season with handmade decorations. A ruffled wreath made of sheet music turns a brick wall into a focal point. Gold painted frames add a little glitz. Winter just may be the perfect time to add layers of texture and shine to your post-holidays mantel. This example by Heather at Setting for Four features disco balls and a large mirror that pour on the glimmer. Metal accents including the candle holders inject beautiful sparkle. For contrast, pine cones and greenery boost visual warmth. Capture the spirit of winter with these simple ideas by Brandi Sawyer. She combines glittery garland and white décor with woodsy pine cones. Silver platters and vintage trophies are just a few of things that dress up this winter mantel by Vicki at 2 Bees in a Pod. Fresh moss brings dashes of greenery. The rustic wreath was made lickety-split by affixing puffs of natural cotton to a grapevine wreath form. 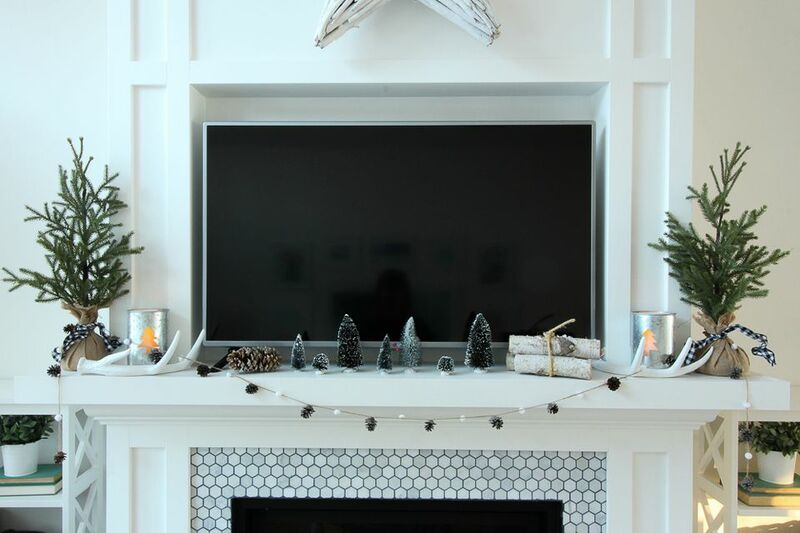 Reclaimed wood and a DIY pom-pom wreath cover up an old TV mount over this mantel decorated by Manuela at A Cultivated Nest. The entire project including the lumber cost less than $30. Because winter isn't very colorful, this mantelshelf decorated by Kimberly at A Wonderful Thought sticks to neutral shades. A pallet wood chalkboard sits front and center. The snowshoes are a fun seasonal accent. The banner is a DIY decoration from the blogger's Christmas collection. This ski-inspired mantel by Amy at My Life From Home is loaded with rustic and homey accents. A cute banner and mini snow skis set the theme. For color, she added faux greenery. A mirror and rustic window frame anchor the arrangement. Create a winter mantel dedicated to snow. For instance, this display by Becca at Adventures in Decorating celebrates winter weather with a seasonal banner. See the two evergreens? Both double as Christmas décor.